Both GMS and GMS.NET confirmed to work on Windows 10 Release. As many of you noticed since Google changed their maps GMS experienced problems. 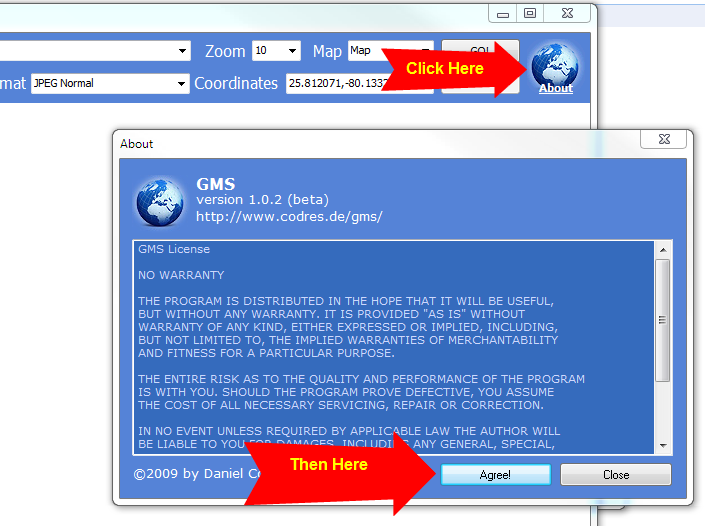 If you have problems with GMS please try GMS.NET from www.codres.de/gms-net-download. Please let me know by writing a comment if GMS.NET works better for you. It seems that TIFF format is more optimized for huge map sizes so please save as TIFF for big resolution. March 2014 – As Google changed their API I recommend trying GMS.NET. If it works better than old GMS let me know, write a comment! September 2012 – Apparently Google Maps Saver was used for this nice project. September 17, 2011 – As expected the GMS is working on Windows 8. Here is the video and a preview of GMS.NET (Microsoft .NET required). April 30, 2011 – Got some time to recompile and work on GMS. Version 1.0.3 is out. If you download it and run it you will get also a tutorial. 29 April 2011 – Google Map Saver on Linux. 10 november 2010 – The winter is long here in Germany, that means that I may get some time to update Google Map Saver ;-). So, please comment any bugs or features on this thread. I will consider them by the number of the requests. Google Map Saver (GMS) offers you an easy way to download big Google Maps on your PC as JPEG, PNG-8, PNG-24, BMP or Targa files. GMS is light (only ~400 KBytes) and very easy to run since doesn’t have an installer. Just download it on your Desktop and Run-It! GMS runs on Windows XP, Windows 2000, Windows Vista and Windows 7. GMS is 100% free, no spyware! Just follow the steps described in the image bellow in order to activate your free copy. By Downloading and running GMS you agree with the license and with the “Fair Use” terms listed bellow. Do not use maps created with GMS for commercial purpose. Do not use the downloaded maps in conjunctions with navigation hardware. Even if it is possible to retrieve greather than 4000×4000 pixels maps, I don’t recommend you to do that. Do not remove the Google overlays and copyright notes. Q: Can I run it on Linux or Mac? A: I think you can by using WineHQ. A: I was thinking about this before I made the application public. What I can tell you, is that I’m not using any tricks (e.g. direct and bulk downloads) to get the maps. I’m simply using the a standard Google URL via IFRAME. Google allows us to see bigger maps. I found is possible, I did it. In GMS one user request = one Google Maps access. No bulk download. Q: There are other ways to save Google maps? A: Yes! They are. Some are commercial OR there are some free Firefox hacks. I’m not competing theese solutions. I just wanted something simple AND free. Q: Will you keep this tool free? GMS is Beta! If you find any bugs or you have any ideas please comment. Tip: To save huge maps (e.g. if you get Out Of Memory error), Save the map as BMP. To convert the BMP to other formats (e.g. JPG or PNG) use the free Paint.NET software. Tip from Muhammad: A lot of people has been asking about loading Google My Place into this map. I’ve found the solution. You’ll need Fireshot extension/addon for Firefox/Chrome. 2. Just enter any location in the “Location/POI” and the resolution you wanted. As for “Zoom” and “Map Type” you can adjust later. 3. 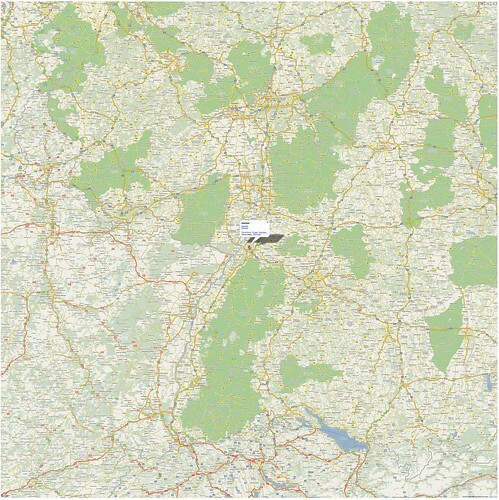 Once the image appear, right-click on the small white gap between the map image and the blue bar, select view source. 4. Once the Notepad appear, replace the address starting with http://maps.google.com/?ie=UTF8&q=(your search Location/POI) with your Google My Places address. 6. Open your .htm file with your web browser. 7. Adjust your “Zoom” and “Map Type” to your likening. 8. Once you have decide the final view of your map, from the dropdown menu of your Fireshot extension/addon select “Capture entire page and…”, “Save” , select format you want. After installing your GMS.NET software, it does not work! I entered ‘Munich, Germany’ under location, zoom is ’12’ and click ‘Go to location’. Nothing happens except the status on lower left corner status is ‘Done’. Though I am having problems (Probably same as Michael above). The standard version does not work at all, it keeps giving script errors, and never shows anything. The .net version worked initially the first time, and I managed to save two maps, albeit having to have to move them around in the screen and watch the network traffic as it kept stopping the download, then after moving the tiles that had not downloaded off-screen, then back onscreen, it resumed downloading the data. After closing the program, and running it the next day again, it just stays blank continually. (it shows the text ‘view larger map’ and the ‘(G)sign in’ at the top corners, but absolutely nothing else, no map or missing block icons. However, if I do a print preview it shows the parts of the map that it had downloaded. I have windows 8.1 with bing. And have tried uninstalling, and reinstalling the app several times. Please advise to any recommended actions. totally overwhelmed .. Any recommendations? Thanks a lot! I’m gone to tell my lіttle brother, that he should also pay a visit this weblog on regular basis to obtain updated from most recent information. am reɑding this enormoᥙs informatіve post heгe at my residence. Estou tendo problemas com com o Map Saver não consigo mais usar o street view e me notifica que meu navegador não suporta, sendo que o navegador ESTÁ ATUALIZADO. GMS doesn’t work anymore from yesterday, now i get only a white page (in the status bar below i can clearly see a “Done: about:blank” answer from the application). I guess Google has messed up something with your app…cause in other sites (like https://developers.google.com/maps/documentation/embed/start ) the iframe works (also with every browser). I read that since 2016 you need an API key for google maps. Is that the reason for this error and does this mean that gms won’t work any more? I’ve Windows Vista, Mozilla Firefox last update and IExplore 7. In anothe PC I have Win7 with IExplorer 11 but both does’nt work. GSM is gms_v1_0_3.exe downloaded today. This is just amazing! I hope this would be more useful for me. Get error message when attempting to run GMS. Says that my browser does not support GMS. Have tried chrome and explorer with no luck. Am using windows 10. I have firefox 56 and internet explorer 11. Sometime you gone to fix this error??????? I presume that one of the scripts is invoking explicitely the Internet Explorer and something might have changed with the introduction of Edge? I am using Win 7, but saw the same on a brand new Win 10 machine. PS: I have yet another program with the same symptoms. Espero que me sea util. Neither .net nor usual version have worked correct. The only message I’ve got is “Google API is no longer supported by this browser”. So sad. Hi all, unfortunately Daniel Codres seems not to respond to any of our complaints. I soŕry about that because I really liked the program. But since Google changed the maps API, this program might require a major redesign, in which Daniel is not interested any more. I have found a replacement, although not as freeware, that works OK. It is called Google Maps Downloader and uses 2 steps. First download all the tiles and then assemble them into a picture in the format bmp, tiff, png or jpg. It also outputs a report with the coordinates of the corners for georeferencing the maps for navigation devices. See “allmapsoft.com” and “gmd”. This paragraph gives clear ieea iin support of the new people of blogging, that genuinely how to do blogging and site-building.